RIFLE, Colo. – Firefighters brought the 400-acre Brush Creek Fire to its final 97 percent containment today. Containment line will not be built on the remaining 3 percent of the fire perimeter because of the extremely steep slope, but a module of eight firefighters will continue to monitor and work the fire as long as needed. The fire has not grown in several days despite strong winds, and firefighters do not expect it to grow further. Today about 60 firefighters, three helicopters and three engines worked the fire, which is about 10 miles north of Rifle, Colo.
GRAND JUNCTION, Colo. – Stage 1 fire restrictions on private lands within Garfield County and on Bureau of Land Management lands managed by the Colorado River Valley Field Office begin June 27. Fire managers base decisions about fire restrictions on specific moisture measurements in vegetation and other risk factors. Several weeks of hot, dry weather has increased fire danger to high levels at elevations below 8,000 feet. These restrictions include BLM lands in Eagle, Garfield, Mesa, Pitkin and Routt counties managed by the Colorado River Valley Field Office, along with private lands in Garfield County. 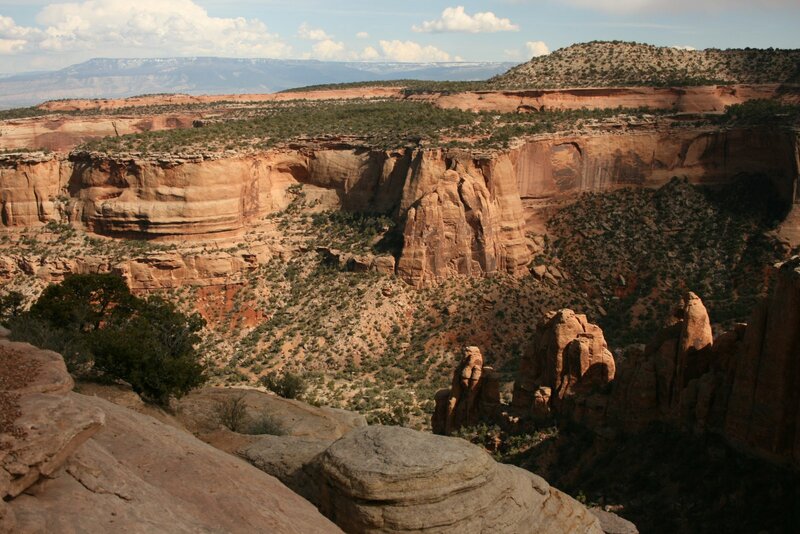 The BLM Grand Junction Field Office and Mesa County are also initiating restrictions June 27. Based on local conditions, the White River National Forest is not initiating fire restrictions at this time, nor are Eagle and Pitkin counties for private lands. Fire officials caution that there is still a fire danger in these areas, and urge caution with fire. Restrictions on these BLM lands will be in place until further notice. Violation of federal fire restrictions is punishable by a fine of not more than $100,000 or imprisonment for not more than 12 months or both. Those found responsible for starting wildfires will also face restitution costs of suppressing the fire. June 25, 2013 6:30 p.m.
RIFLE, Colo. – Firefighters now have the 400-acre Brush Creek Fire 90 percent contained. Today about 120 firefighters, three helicopters and three engines worked the fire, which is about 10 miles north of Rifle, Colo. Firefighters expect to have the fire 97 percent contained by the end of the day tomorrow, when most of the remaining resources will be released to other fires or to return to their home unit. Containment line will not be built on the remaining 3 percent of the fire perimeter because of the extremely steep slope, but after tomorrow a small crew of firefighters will continue to monitor and work the fire as long as needed. The fire has not grown in several days despite the strong winds, and firefighters do not expect it to grow further. The work to contain the Brush Creek Fire is a closely coordinated effort among crews and personnel working for the federal Upper Colorado River Interagency Management Unit, the local Colorado River Fire Rescue, Garfield County and the Garfield County Sheriff’s Office, and Colorado Parks and Wildlife. For the latest updates on the Brush Creek Fire, visit www.inciweb.org, www.facebook/coloradoriverfirerescue, www.garfield-county.com, or call 970 319-4130. June 24, 2013 6:30 p.m.
RIFLE, Colo. – Despite winds gusting in excess of 30 miles per hour this afternoon, firefighters working the Brush Creek Fire 10 miles north of Rifle, Colo., have brought the 400-acre fire to 65 percent containment. About 180 firefighters and personnel worked with four helicopters and three engines to secure all but the northern flank of the fire today. Firefighters were able to make good progress on the northern flank, which remains active and is in an extremely steep area. No structures are immediately threatened at this time. Rifle Gap Reservoir remains closed to boating on the west end because of helicopter activity. 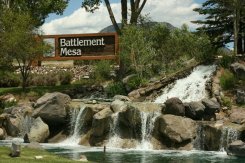 The Battlement Mesa Service Association President, Keith Lammey, writes a monthly article about Battlement Mesa. The article is published in the Grand Valley Echo. The June 2013 article, "Battlement Mesa’s Oil Shale History, Part Four," appears below. In earlier segments of “Battlement Mesa’s Oil Shale History” the historical aspect and the impact of oil shale development in our area was examined. Part four of this series shifts the focus from looking at the history to looking at the future. It is relatively easy to examine the past. In fact, it is easy to gather the bits and pieces of historical significance and tell the story of what has happened in an earlier period. Looking into the future is much more difficult. In part four, we will examine (not answer) the “what would another oil shale boom mean for us” issue. I’d say, well it all depends. As the BMSA President, I am eager to see our community grow and prosper. As an owner/resident I have to add, but not at the expense of our quality of life. From the economic perspective, the buy low; sell high concept makes perfect sense. When quality of life is added to the equation the concept gets complicated. Sure, we all want to buy low and sell high but when we’re talking about the community where we live, we want to buy low, then enjoy a splendid quality of life and, probably, eventually sell high. Even the experts can’t agree. Worse yet, they seem to be on opposite ends of the spectrum. Proponents seem to say that, with the in-situ processing technique, you will hardly notice that we’re here. Environmentalist say that the in-situ process is unproven and that, even if it is possible, it uses far too much energy to produce the energy that can be extracted from oil shale and, they add, plus there are a lot of environmental consequences. AMSO, Chevron, Exxon-Mobil and Shell are still actively pursuing oil shale projects. These four projects utilize the in-situ process. The project’s successes, challenges and failures are generally considered “corporate secrets” thus we are unable to acquire adequate information in order to conclude which, if any, of the four projects could be successful. On the opposite end of the spectrum, it is difficult to judge the impact of environmental concerns. In terms of actual years, the span between the last Battlement Mesa oil shale boom and present day is a mere 30 years. In contrast, in terms of where our society has moved in terms of protecting our environment, the gap is much more dramatic. Today’s oil shale projects must comply with strict regulations. Federal environmental laws include: the Clean Air Act; the Clean Water Act; the Safe Drinking Water Act; the National Environmental Policy Act (NEPA); National Historic Preservation Act; and the Resource Conservation and Recovery Act, plus several more. In short, I believe that it all depends on how oil shale development would impact our quality of life. Unfortunately, it is impossible to know whether or not oil shale can be extracted in a manner that has minimal impact on our quality of life. Finally, I am intrigued by the biggest wild card of all: What future political event would drive oil shale development forward regardless of its impact on our quality of life. Virginia City, Montana had a revival of sorts. In 1898, after an estimated (in today’s dollars) $40,000,000,000 worth of gold had been extracted from the Alder Gulch area around Virginia City, a mechanical marvel – the mining dredge – arrived in the area to extract even more gold. After several more years, Virginia City’s gold rush ended for good and, without its colorful history and tourism, Virginia City, Montana would have become a ghost town. One of the differences between the Virginia City story and the Battlement Mesa story is that, unlike Virginia City, the natural resource that created Battlement Mesa’s brief but robust activity hasn’t been exhausted. The gold is gone from Virginia City’s Alder Gulch but our area is still “rich” with oil shale. In fact, the Green River Formation in Colorado, Utah and Wyoming is estimated to contain up to 4.2 trillion barrels of oil based on an average of 15 gallons of oil per ton. The richest and thickest known oil shale resource in the world is located in the Piceance Creek Basin of Colorado which is estimated to have 1.52 trillion barrels of the estimated 4.2 trillion barrels contained in the Green River Formation. 1.52 trillion barrels seems like a lot of oil, but how much is it, really? Experts say that it is between one and six times the total oil reserves of Saudi Arabia and significantly greater than the known U.S conventional oil reserves. Experts can’t agree on whether or not there will be another oil shale boom? 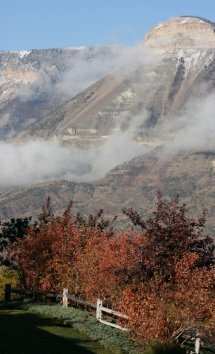 Nevertheless, since the Green River Formation’s oil shale is mostly untapped, the world’s conventional oil supply is flat or declining while alternative energy is perhaps decades in the future and several firms are continuing oil shale research, it is my belief that, as unlikely as it seems now, there could be another oil shale boom in our future. Click Here to read additional President's Message articles. Where is the fire? – 4 miles north of Rifle Gap State Park on BLM land adjacent to Middle Rifle Creek. What’s it doing? – Quiet thru the night. 30% containment at this time. Fire Weather – Hot and dry, mid 80’s this afternoon, winds from the SW with gusts up to 25 MPH. Objectives for this afternoon – 1) Safety for all firefighters and public, 2) Today’s primary objective is to complete construction of a fireline around the fire with the emphasis on the northern end of the fire. Mopping up will begin on the flanks of the fire. Demobilization has begun releasing 6 engines, 4 SEATs and one hand crew. Steep slopes, heavy fuels in timber make containment difficult on Brush Creek Fire near Rifle Gap State park. Rifle, Colo. – Hand crews and air resources are working together to contain this fire in a rugged part of Garfield County. This approximately 400-acre fire is close to the border between the BLM and the White River National Forest boundary approximately 10 miles north of Rifle. GRAND JUNCTION, Colo. – Crews from the Upper Colorado River Interagency Fire Management Unit are now responding to two fires in the eastern part of the region. Crews began fighting the Brush Creek Fire late yesterday approximately 10 miles north of Rifle. The fire burning on BLM managed land is approximately 300 acres with no structures threatened. A Hot Shot Crew, a Crew from Columbia River, Four Engines, and two helicopters are working on the fire now. Two Type 2a crews are en route to the fire and air tankers have been ordered. Fire fighters are working to establish some containment on the fire. Crews continue to work on the Derby Creek fire burning on Forest Service land approximately nine miles northwest of Burns. The fire remains less than three acres but spotting ahead of the fire continues to be a problem. There is one engine and a local crew still working on the fire. Contacts: Lee Ann Loupe, Fire Information Officer, 970.874.6717 (business hours); cell: 970.596.0246 (after hours & weekends). Grand Junction, Colo. (June 14, 2013, 7 p.m.- The Ward Gulch Fire is located approximately 3 miles north of Rifle Gap Reservoir. The fire is thought to be caused by lightning that moved through the area last night. Estimated to be 100+ acres in size and rapidly growing, it is burning in grass, sage and juniper and has threatened structures near the Fish Hatchery and Rifle Mountain Park. A type III incident management team will take over the fire this evening or early Saturday. A very large airtanker (VLAT) was ordered out of Pueblo to assist in suppression efforts. Meanwhile, three single engine airtankers (SEATs) worked the fire this afternoon, dropping retardant to protect key resources (structures) and to attempt to slow the growth. Two heavy air tankers and a type II helicopter also worked the fire today. Three engines, several overhead and chase crews out of the Upper Colorado Interagency Fire Management Unit are on scene and 3 type II crews, each comprised of 20 firefighters were ordered to the fire. Additionally, the Juniper Valley regular and trails crew, providing an additional 30 firefighters are on the fire. Resources from Colorado River Fire Rescue are also on scene. Citizens are encouraged to avoid the area for personal safety as well as for the safety of the firefighters and fire resources. Highway 325 has been closed in both directions 7 miles north of Rifle, due to wildfire in the area with no estimated time of opening. Firefighters continued to work on the Beaver Creek fire throughout the day. Reports from the fire indicate that there was very little fire and smoke today and efforts concentrated on putting out hot areas and strengthening containment lines. Meanwhile, because of the lightning that moved through the area yesterday, Upper Colorado River fire resources have been busy responding to smoke reports today as temperatures increased. Grand Junction, Colo. (June 14, 2013) - The Beaver Creek fire was reported at approximately 8 p.m. June 13. Upper Colorado River Interagency fire resources (UCR), as well as Rifle Fire Protection and Grand Valley Fire resources responded. The fire is located about 7 miles southwest of Rifle, on Log Mesa and is burning in sagebrush and pinion-juniper fuels. The fire grew to approximately 7 to 10 acres in size, largely driven by dry fuels and strong winds until about 2 a.m. this morning. I-70 West bound at mile marker 91 has reopened to one line of traffic.